HOUSTON — Carlos Correa, Jose Altuve and the high-powered Astros led the majors in runs, hits and batting average in the regular season. Now that it’s playoff time, Houston is still hammering away. Correa homered , doubled and drove in four runs, Altuve got two more hits and the Astros battered the Boston Red Sox 8-2 Friday to take a commanding 2-0 lead in the AL Division Series. George Springer also homered to back Dallas Keuchel in Houston’s second straight romp by the exact same score. The Astros will go for a sweep in the best-of-five matchup Sunday at Fenway Park, a year after Boston was swept in the ALDS by Cleveland. Brad Peacock (13-2) starts for Houston against Doug Fister (5-9). “We couldn’t really script it any better,” Keuchel said. A day after Altuve hit three home runs in the playoff opener, he got things going with a two-out single in the first inning off Drew Pomeranz. Correa, who went 0 for 4 on Thursday, made it 2-0 when he launched a towering shot onto the train tracks atop left field. Keuchel pitched into the sixth, allowing one run and three hits while striking out seven to improve to 3-0 with a 0.96 ERA in three career postseason starts. After Jackie Bradley Jr. had an RBI single in the Boston second, the Astros started to break away. Springer hit his first postseason homer when he sent the second pitch of the third inning into the front row of the seats in right field. So is Red Sox manager John Farrell surprised that the series has been this lopsided so far? 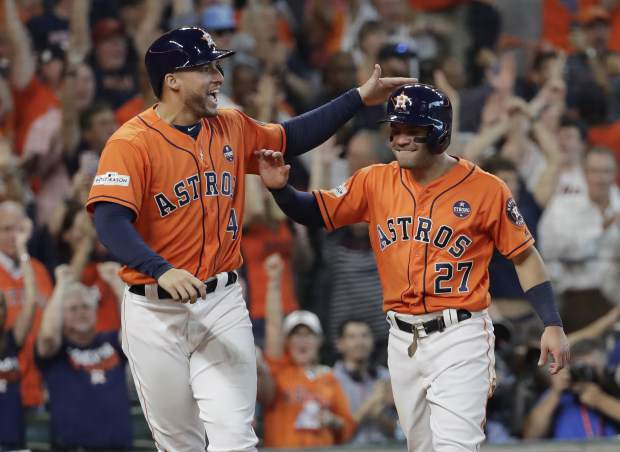 A double by Alex Bregman set up an RBI single by Altuve later in the third, making it 4-1 and ending Pomeranz’s first career postseason start after two relief appearances. The lefty kept his head down as he trudged toward the dugout after being lifted. David Price, the starter-turned-reliever with the $217 million contract, pitched 2 2/3 scoreless innings for the Red Sox. Following his exit, Houston tacked on four runs in the sixth. A two-out intentional walk to Altuve, the major league batting champion this season, led to a two-run double by Correa . The top overall pick in the 2012 draft and crown jewel of Houston’s yearslong rebuilding project raised his hands in delight and motioned for the crowd to get louder as he stopped at second base. Red Sox right fielder Mookie Betts had an error that looked like it was pulled from a blooper reel earlier in the sixth when he caught a fly ball by Bregman then simply lost the ball as he tried to throw it back in. Betts looked confused as the ball dribbled away from him and he was charged with an error, allowing a run to score. Keuchel, the 2015 AL Cy Young Award winner, known as much for his beard as his devastating sinker, was cheered on by Houston’s other famous bearded superstar as Rockets guard James Harden watched from a front-row seat behind home plate. Keuchel’s father, Dennis, also was in attendance and multiple television shots showed him looking a mixture of excited and nervous as he gazed at his son’s work. The left-hander had trouble settling in early and after needing 30 pitches to get through the second inning, it looked like this start might be a short one. But he struck out the last two batters of that inning as the first of 13 straight he retired. Keuchel exited to a standing ovation after walking Hanley Ramirez with two outs in the sixth inning. Altuve, who hit .346 this year, kept punishing pitchers. After singling in his first two trips to the plate, giving him five hits in the series, the Red Sox had seen enough and intentionally walked him in the fourth. That drew a loud chorus of boos from the home crowd, which greeted Altuve with a standing ovation in his first at-bat. Farrell was asked if the fourth inning was too early to intentionally walk Altuve. Boston also gave him a free pass in the sixth inning, but had to pitch to him in the seventh with the bases loaded and two outs. Austin Maddox, who gave up Altuve’s third homer on Thursday, jumped into the air and pumped his fist after striking him out. It didn’t matter much. Even with the strikeout, his average in the series is .714. Betts said his wrist flared up on a swing in the eighth inning but that he’s OK.
“It’s going to take some time to heal, but we don’t have that kind of time right now,” he said. Correa, who is from Puerto Rico, has partnered with Astros owner Jim Crane to charter a plane filled with water, food and other supplies to deliver to the island on Sunday to help those affected by Hurricane Maria. “Obviously a lot of people are suffering from hunger and they’re going through tough times right now, so I just want to bring a little bit of help over there,” Correa said. Fister (5-9, 4.88 ERA), who pitched for the Astros last season, will start for Boston in Game 3 on Sunday against Peacock (13-2, 3.00 ERA), who will be making his postseason debut.